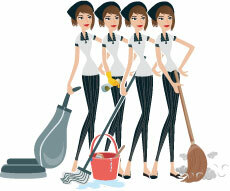 4 Sisters Cleaning has been providing high-level cleaning for over 7 years. We began when Maria Carmen and her 3 sisters, discouraged by the inefficiency and low quality of service of other cleaning companies, decided to start a cleaning service of their own. Developing a new way of providing home cleaning, they set out to update the cleaning industry. Today 4 Sisters Cleaning is one of the fastest growing cleaning and janitorial services in the Houston Metropolitan area. We are bonded and insured for your protection. We also carry an A+ rating with the Better Business Bureau. Because we are independently and family owned, our mission is to earn your business by not only providing detail oriented cleaning, but by providing superior customer service. We will work hard to resolve any concerns or issues that may arise after a visit. 4 Sisters Cleaning provides high quality cleaning services for customers that are looking for more detailed cleaning beyond the traditional surface cleaning. We do not give our cleaning teams time restrictions so that they may have ample time to do a distinctive job. We provide thorough cleaning in a timely fashion. Our teams are given a limited amount of homes to clean per day so that they may take their time in providing proper attention to specific requirements. We do our best to keep the same team assigned to each home so that they may become familiar with its needs.